Special meal: German Pig trotter Deluxe hotels, bus, Chinese and English speaking tour guide. 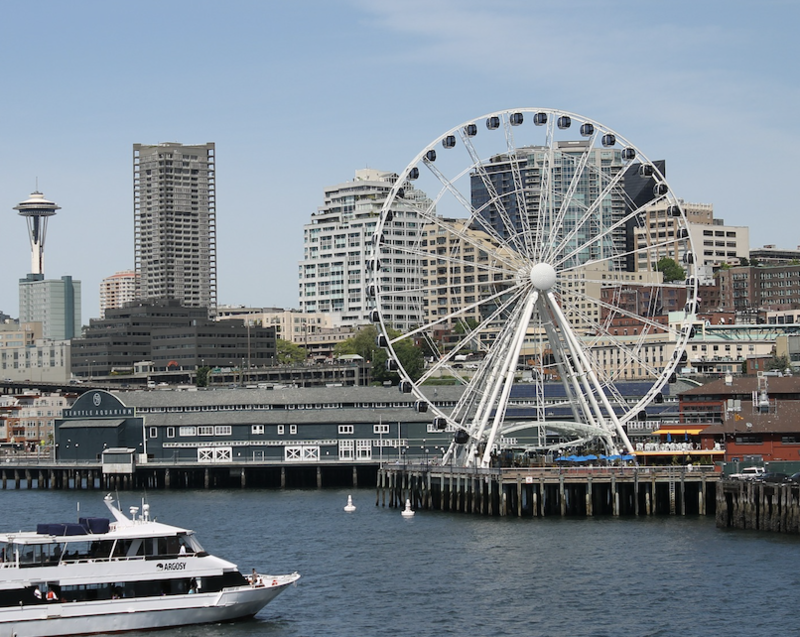 Night tour: Flight arrivals before 6:00PM: Seattle Fisherman Wharf – Kerry Park We will firstly travel to Seattle Great Wheel, which is a giant Ferris wheel at Pier 57 on Elliott Bay in Seattle, Washington. With an overall height of 175 feet, it was the tallest Ferris wheel on the West Coast of the United States when it opened on June 29, 2012. Next stop is Kerry Park where visitors can have a panoramic city view of the entire Seattle. It is a perfect location for photography and if you see Space Needle with a backdrop of Mount Rainier in any marketing photos of Seattle, this is exactly where to take the pictures. In addition, the park was one of the many stops on the finale episode of the third season of Amazing Race. Guests can pay the Morning or/and Night tour fee in advance, thus we will guarantee and save the seats for the guests. If guest intends to join the tour but is not willing to pre-pay the tour fee, we will arrange the seats according to the availability of the arrival date. First come, first serve. To arrange the Morning Tour or/and Night Tour, it requires at least 4 guests enrolled. If less than 4 passengers on the departure day, we will cancel the tour and issue a full refund to the guest. Hotel : Red Lion / Quality Inn / Comfort Inn / Hampton Inn or similar. The Jade City Seattle is the largest city in the northwestern United States, the 15th largest metropolitan area in the United States, and is considered to be the fastest growing major city in the United States, located in Evergreen - Washington. [Pioneer Square] Seattle's origin-one of America's largest historic buildings. [Parker Market] Seattle's most important tourist attraction, with the world's largest coffee chain Starbucks first store, the world's most disgusting attractions - chewing gum wall, throwing fish show fish stalls and other famous attractions. [Space Needle] Seattle landmark building, standing on top of the tower, not only can see the landscape of the entire Seattle city center, you can also see the Olympic Mountains, Cascade Mountains, Mount Rainier, Elliott Bay, nearby islands and so on. [Chihuly Garden and Glass Museum] led the blown glass industry into the field of large-scale sculpture. The famous American glass artist, Chihuly, is famous for his unique style of work. [EMP Experience Music Project Museum] is dedicated to the history of pop music, science fiction and popular culture and explores the museum. [Kerry Park] a park on the south slope of Queen Anne Hill in Seattle, Washington, located at the corner of Second Avenue West and West Highland Drive. That view encompasses downtown Seattle, Elliott Bay, the West Seattle peninsula, Bainbridge Island, and Mount Rainier. [The Museum of Flight] the largest collection of flight-related collections in the United States, with a collection of 145 aircraft, roughly divided into six exhibition areas, the number of aircraft collected here is amazing. Olympic National Park is a national park located in the Olympic Peninsula, WA. The park consists of four regions: the Pacific coastline, alpine areas, the west side temperate rainforest and the forests of the drier east side. With nearly one million acres, Olympic national park encompasses several distinctly different ecosystems and protects a rich mosaic of natural and cultural history. It protects 73 miles of wild Pacific coast. Tide pools, sandy beaches and rocky cliffs can all be found here. At the center of the peninsula are the majestic glacier capped Olympic Mountains. 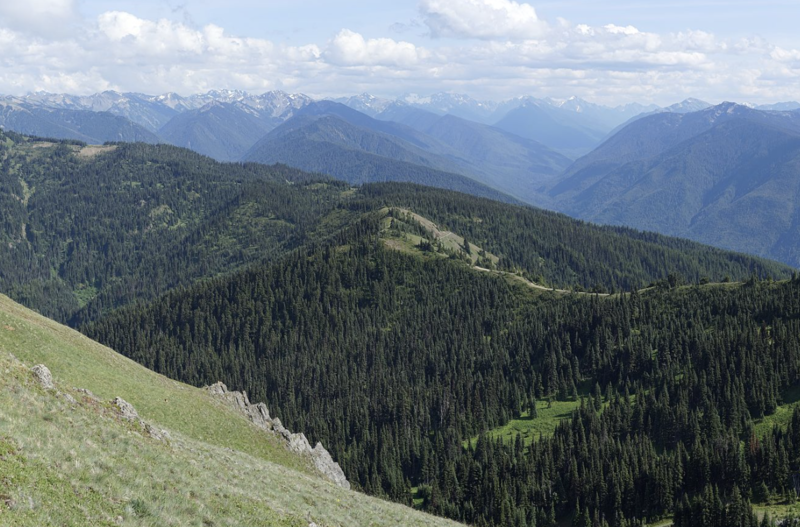 Hurricane Ridge, over a mile high, offers spectacular views of mountains, wildflowers, deer, black bear, and other wildlife. （If we can’t drive to the Hurricane due to the bad weather, we will go to the other attractions in Olympic National Park.）The 10-acre natural lake, Lake Crescent, located at an elevation of 600 feet is a pristine area that provides visitors with an extraordinary place for recreation and relaxation. Only a few places of interest allow the automobiles to enter the natural beauty. There is a wealth of outdoor activities with over 900 miles of trails traversing the vast interior of the recognized wildness. When going back to Seattle, you can take the Bainbridge Island ferry to enjoy the breathtaking views of Seattle’s coastlineSee the Snoqualmie Falls, one of Washington State’s most popular scenic attractions visited by 1.5 million visitors every year. Explore Leavenworth the German village which is 2.5 hours’ drive northwest of Seattle, the most beloved town in this area where people celebrates all the time. You can see beautiful maple leaves in fall, and in winter, the town is adorned by white snow and holiday decorations. Lovely atmosphere can be found everywhere all year round. Enjoy shopping of delicate European souvenirs and taste the authentic German food and beer, or try on some traditional German costume clothes. Mt. Rainier is the tallest volcano of the Continental United States, the 5th tallest mountain of the entire US territory. The mountain top is covered by snow all year round. When snow melts, snow water flows down in a large volume, which creates beautiful waterfalls and vast lakes meanwhile irrigates the forest land. Mount Rainier is circled by the 93-mile-long Wonderland Trail and is covered by several glaciers and snowfields totaling some 35 square miles. Carbon Glacier is the largest glacier by volume in the contiguous United States, while Emmons Glacier is the largest glacier by area. 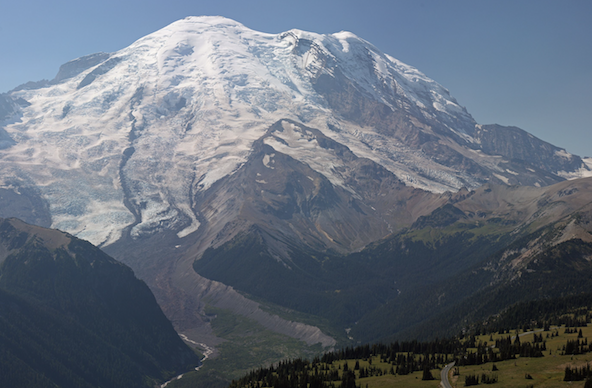 About 1.8 million people visit Mount Rainier National Park each year. Mount Rainier is a popular peak for mountaineering with some 10,000 attempts per year with approximately 50% making it to the summit. We will go along the Wonderland Trail by stopping at 2-3 scenic spots.（According to the situation of the day）. In the summer, we will lead you traverse the Volcano mountains. 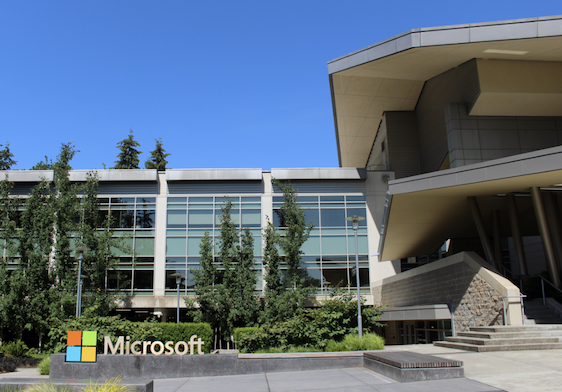 * Note: Upon your tour completion, we will send you to the Seattle - Tacoma International Airport (SEA) only. Please book your flights departing after 19:00. Tickets are subject to change without notice. 1. Free group pick-up: 9:00AM-10:00PM, you may need to wait other passengers at the airport. 2. Paid 24/7 pick-up: $120 per first two persons with $10 for each additional person. (In case of attraction closures (due to holidays or construction, etc. ), tour guide may make some necessary changes to the itinerary accordingly. If the weather condition, war, general strikes and other unforeseen circumstances interrupt the journey, our company reserves the right to rearrange the journey without refunding the tour fee. Tour fee exclude: the meals, attractions tickets, service fee ($10 per person per day), and any private costs (such as hotel telephone charges, laundry etc. ).